Selena Gomez has released her second collaboration of 2019 and it comes in the form of a song that will have you grooving your way into spring. 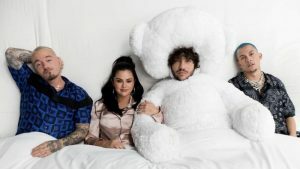 Along with Benny Blanco, Tainy, and J Balvin, Gomez dropped the new single “I Can’t Get Enough” on Feb. 28. This is her second single of the year, coming just one month after the release of Julia Michael’s “Anxiety,” on which Gomez was featured. In comparison to that track, “I Can’t Get Enough” has a much lighter vibe. Gomez’s vocalizations provide part of the beat for the bilingual Spanish and English song and it will definitely make you want to move.